Long Island, NY is a fabulous place for bikers, but if for some reason you find yourself involved in a motorcycle crash you are going to need to consult with experienced motorcycle accident lawyers. Motorcycle accidents present complications not present in typical car accidents and you need to have an attorney who not only understands the intricate nuances of a motorcycle accident, but also of Long Island itself. Every state, county, town or city is different and different laws and rules apply to dealing with motorcycle accidents. So, don’t take any chances. If you’ve been injured in a motorcycle crash talk to attorneys experienced and knowledgeable in motorcycle accidents. At Riegler and Berkowitz we will make sure all possible outcomes are accounted for, and an appropriate strategy for dealing with them is crafted. As with every personal injury claim, it is of utmost importance to move quickly. The first few days and weeks post accident are critical to the success of your claim. We suggest that you call us today at (631) 608-4114 for a free consultation. Or, if you’d like, you can fill out the easy Motorcycle Accident Case Evaluation Form below. Don’t Settle For Less Than You’re Entitled To! 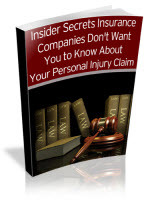 That’s why we’ve created this Free Report that will reveal the insider secrets insurance companies don’t want you to know about what to do when you’ve been injured and how to protect yourself from insurance company tricks. Simply fill out the form below to get your hands on this powerful report right now.